While the issues in my Book of Thoughts cover a set of 5 key themes that I explore at many levels, I haven’t distilled them down into a single post for some time. So towards that end, I wanted to use this post for an brief article (there may be related articles to come) on improving healthcare. One of the key points made in the Book of Thoughts is that life is full of patterns, so this article will simply explore some of those key patterns that I see across every healthcare strategy piece I see. Hopefully by using this simple structure, this will make for a reasonably easy read, but may also form the basis of a template that you can reuse if you find it useful. Every Strategy usually starts with a bit of mission and vision. This one is about healthcare (though the principles are actually so generic as to be reusable across other industries). So if we look to healthcare, we see a large and growing industry, so large that it is according to some commentators on the way to becoming the biggest industry on earth? Lets accept that surge in growth for a moment. Yet wait…. if healthcare is growing at such a rate what about other industries such as education, food, housing, technology? After all health is of course important, yet it should not take over other important human activities. So we need to contain the cost and growth of the healthcare industry. That much is already evident when we see the steadily increasing sense of crisis across the healthcare industry in the west.. it is widely agreed that healthcare needs to be reformed.. it needs to change. So it we now look at the need for Healthcare change.. any strategy is simply about moving from the current state (real) to a preferred future state (ideal) and outlining the way forward. Lets look at the key patterns observed across healthcare improvement strategies. If your in a hurry lets cut to the chase with a related graphic..
Every change starts with somebody.. a person.. you/me/a.n.other.. So as is increasingly understood leadership is key to change. In the industry of healthcare, where like every other “culture eats strategy for breakfast”, one has to understand the culture to get things done. The most influential culture in healthcare may be the medical culture, its hard to deny it. So who needs to lead the change.. that would be clinicians.. hence the need for clinical leadership..
Moving up from individuals, we’ll mention teams. So “clinically led” teams are the next important unit of influence. A typical healthcare organisation is often made up of many diverse teams. Hopefully if well led by competent clinicians then they will work well … together with their management colleagues. There is an emerging saying from the NHS.. “clinically led- managerially supported”.. the point being that there needs to be a close union of effort between what have been distinct and somewhat dysfunctional camps who have not got on very well. We need to get over that and move on and work well as teams. Organisations of multiple teams are just that, groups of groups. Diversity is to be expected in healthcare and to be fostered, but within that diversity to succeed as a group we must look for common ground. Process, i.e. perhaps can be very simply explained as what people do, is an area where the diversity of healthcare can appear a real problem but where there is common ground for all to share. Some say that hospitals are now amongst the most complex organisations on earth. Certainly one can look at a hospital and be overwhelmed by the complexity of the process within.. However if we look for common patterns in process, generic processes can be seen all around. These core “processes” of healthcare are fundamental to the core healthcare “services” required by patients (i.e. Assessment, Investigations, Procedures) which is where folk can collaborate and cooperate to build a more patient centred approach. We will return to this point shortly to see how this service orientation can help elsewhere. 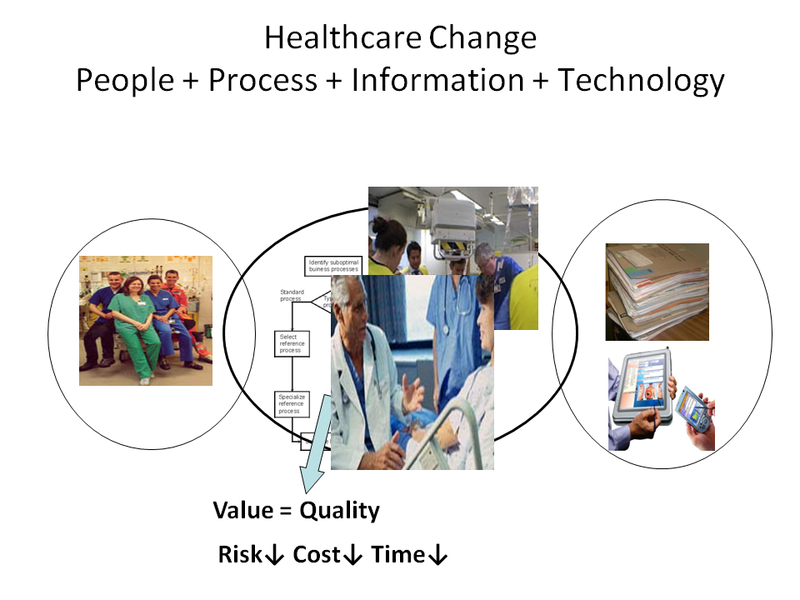 The approach to process change should be a combination of Lean and Agile, cutting out the waste with small steady incremental improvements..
Healthcare can be understood as an information intensive industry. The key drivers of healthcare improvement…. Quality, Safety , Time, Cost are all information dependent. You can’t deliver high quality and safe patient care without good information. You can’t run a healthcare service or service improvement programme without good information. You cant make breakthroughs in healthcare research without good information. So healthcare needs information . In technical terms , which I’ll come back to in more detail in a later post, one has generally 3 options for health IT. The naming convention I use is pretty straight forward. A- stand-alone healthcare applications that are crafted for a niche clinical specialty need (eg Renal Disease). There are hundreds and thousands of these across healthcare. B – integrated healthcare applications that are aimed towards a more generic clinical need (eg Ordering Tests, Managing Medication). These are very challenging to integrate, but that’s the point, so it become known as an approach called “best of breed”. C – enterprise wide applications are aimed at supporting an entire healthcare organisation, though drawing a line around the boundary is nigh on impossible. My view is that the industry is moving slowly towards a more enlightened approach to B.. towards what’s known as a Services Oriented Architecture (SOA).. with an increasing interest in open standards and open source. If done right there should be a good fit between the key core processes of the organisation and this approach. So then if done properly these elements of change should deliver better value. While Value is a hard concept to define , one will find that again it is generally measured on a mix of the 4 factors mentioned earlier.. Quality, Safety, Cost, Time. That’s all that’s needed for now. If you look hard enough at any health strategy you come across, you”ll find these patterns at every turn.. If you need to devise a healthcare strategy, those patterns are impossible to avoid. So there’s your start.. more later..